Thirteen more bodies have been recovered in California, bringing the death toll in the US state's deadliest wildfire to 42, officials say. At least 228 people are missing as the Camp Fire continues to rage. Nearly 7,200 structures have been destroyed, and another 15,500 are at risk. Speaking at a news conference on Monday evening, Butte County Sheriff Kory Honea confirmed the number of dead and the official number of missing. In the south of the state, other wildfires are menacing lives and property. The Woolsey Fire has so far killed two people as it damaged beach resorts, including Malibu. President Trump has declared a "major disaster" in the state, making federal aid available to affected residents. Paradise and its surrounding areas bore the brunt of the Camp Fire - the largest blaze - which started in the nearby forest on Thursday. She described the scene as "exactly like any apocalyptic movie I have ever seen" and said she did not know if she was driving towards death or out of harm's way as the sky blackened. 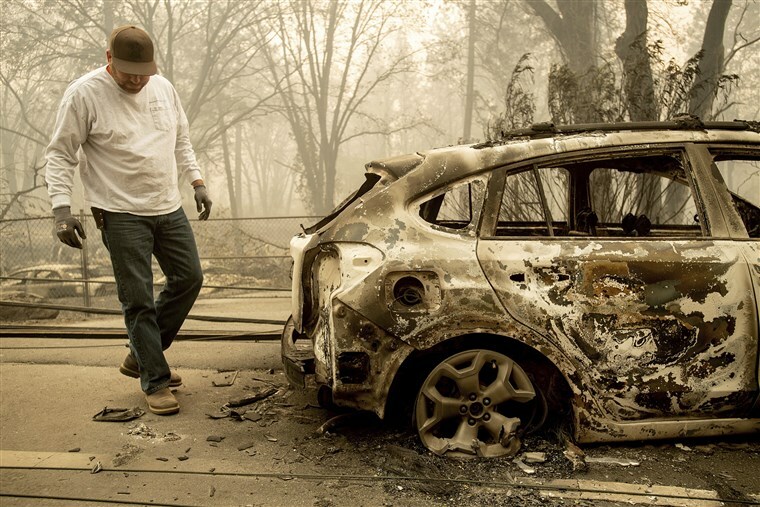 "I had to drive through the fire - it was awful. It was probably the most awful experience I will have in my life," she told the Newsday programme. "It was traumatizing, we will be traumatized for a long time. My whole community was traumatized - I can't watch the videos anymore because I actually went through it." It has consumed at least 85,500 acres and destroyed at least 177 buildings, officials said. It is only 10% contained. The smaller Hill Fire, nearby, has scorched 4,530 acres and is 75% contained.